We live in Wisconsin, where it is cold in more months in the year than it is warm. Namine gets sick easily, and she loves to play in the snow. This weekend, we got a lot of snow. I mean, a lot of snow. The weather forecasters predicted something like 3-5 inches, but our backyard had more like 5-8 inches. Namine has been asking to play in the snow, but we just haven’t been able to, and for a couple reasons. Firstly, we simply haven’t gotten a really good snowfall. Oh, it’s been cold, and we have gotten snow, but not enough in which to have a good romp. The second reason is really the more important: Namine has been on-again, off-again sick for pretty much the entire winter. To be fair, any family with a pre-adolescent child is going to be fighting colds all winter long; it comes with the territory, since your kid and her friends are going to be trading germs. You can’t get away from it. But it’s worse for Namine. She has a weakened immune system, although it’s unclear if that’s just her — the way she was born, like her having Pierre Robin sequence or caudal regression syndrome — or if it’s because she had a tracheostomy tube. We do know that having the trache affected her lungs. It resulted in what her doctors called “lung disease,” even though it’s not technically a disease. The upshot of all this is that Namine gets sick more easily than her peers. But when she asked if she could play in this recent, massive snowfall, we couldn’t say no. After all, this was the kind of snow she’d been looking forward to since before winter began. But we weren’t laissez-faire about it, either. We made sure to bundle her up as best we could, and I think she ended up with something like four or five layers on before we went outside. She had a blast playing outside; we all did. Namine, Jessica, and I threw snow at each other. 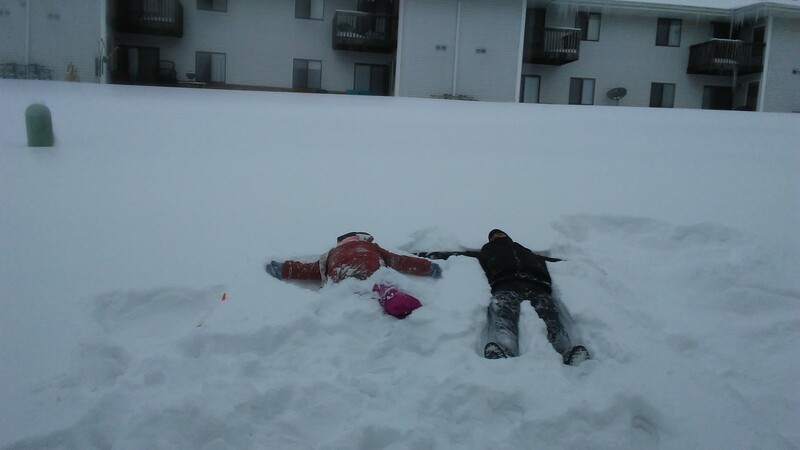 All three of us made snow angels. Jessica and I climbed to, well, not the top of the hill in our backyard, but pretty far up (no small feat in that deep snow) and rolled back down. Namine climbed up a little ways and rolled back down, too. And when we were thoroughly soaked, we came in to a nice cup hot chocolate.